A young man’s wish and passion for the guitar! I received a call from Cara Foster, one of the newest Child Life workers at Rainbow Babies’ and Children’s Hospital. She has a young man on the transplant list. He’s waiting for four organs and is always in the hospital. The staff has come to know him well and his passion for the guitar. When he’s a patient at Rainbow Babies’ and Children’s Hospital, the first thing he always asks for is the guitar that the music therapy department has to loan to the patients. 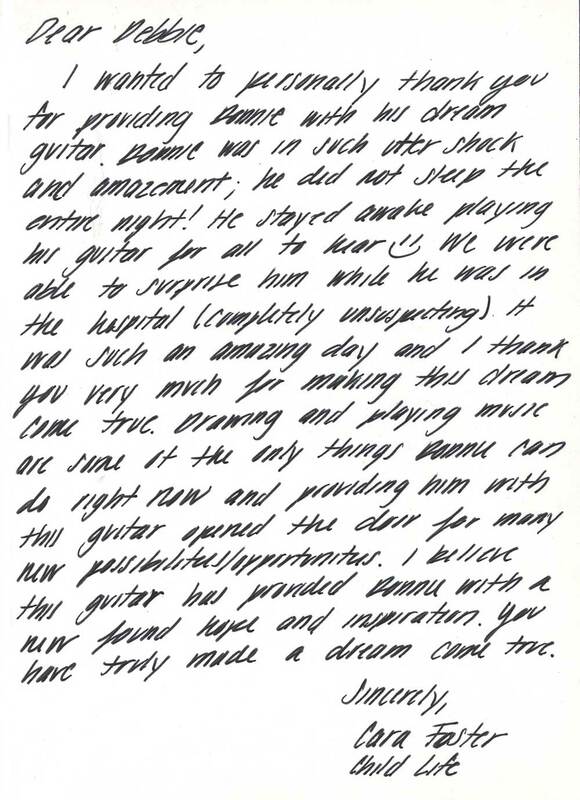 Cara told me that he’s saving every cent of his money for his own guitar, and she and the staff would love to surprise him with a guitar of his own. I replied that the Leprechauns would love to help and we’ll have a beautiful guitar ready and waiting for him. 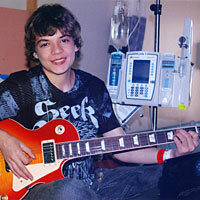 The next time he was admitted to the hospital, he immediately asked for the guitar from music therapy. Cara said, “I’m sorry, someone else is using it. But you might like to have this”. She brought in the guitar in a case with a bow on it. He was stunned and so excited to realize this was his to keep. It was beautiful, and way beyond his wildest dreams. He still has the money he saved to spend on another dream for himself.